Ever think "I've got nothing in the fridge to make for dinner"? You have to eat and don't feel like going out or to the grocery store. I went through the fridge and I had some spinach and salsa. In the cupboards lots of dried rice, pasta, couscous and quinoa. I also had the Textured Soy Protein (TSP) pieces that I talked about in previous posts....oh, and some avocados from my tree that just ripened today. This is what how I made it. Boil the water with all of the dried herbs and spices. Add the TSP for five minutes and remove with a slotted spoon to a bowl and add some of the liquid from the pot. You should keep about 2 cups in the pot. Put the quinoa in the pot, cover and cook for 10 minutes. After ten minutes, remove the lid and add the spinach. There should be enough water left to cook the spinach. Store it into the quinoa and cook for another two minutes covered. Slice the TSP into strips When the quinoa/spinach are done, put it in a bowl and add the TSP, salsa, avocado and Braggs Amino. That's it. 15 minutes start to finish, unless you count the "I've got nothing in he fridge to cook time". This recipe is great as a meal on it's own or to top baked potatoes, use as a pizza topper, put in tacos, burritos or taco salad, enchiladas, pasta sauce...the list goes on. Can you tell I loved it? Dry Mushrooms. Let them soak until they become soft then chop the mushrooms up and strain both. In a non-stick skillet add all of the liquid and then all of the dry ingredients except the TSP and Chopped Mushrooms. Once the liquids come to a boil, add the TSP and Mushrooms. Continue cooking until the liquids are almost gone. The Spinach is just Steamed or quickly boiled fresh baby spinach (about 3 cups) served with fresh lemon. You're done. I’m not one to get political here on my blog as I don’t think this is the appropriate forum (or Facebook for that matter), but I am passionate about something that affects us all and it does have to do with health and nutrition, it’s a non-partisan issue, oh, and it’s my blog…the issue is about GMO vs. Non-GMO. California has an initiative on its ballot this year that at face value seems like a no brainer. At issue is whether or not the food industry should label products GMO (Genetically Modified Organics) if, in fact the ingredients they use are. A great deal of our corn, soybean, cotton, wheat, canola, sorghum and sugar cane products in this country (and around the world) are grown with GMO seeds (in the 90-98% range), and since so many of our products contain some or all of either of these ingredients, it will be on a lot of labels from fresh and canned fruits and vegetables, baked goods containing flour and drinks containing high fructose corn syrup. A little history about my thinking on this. Back when they were first proposing modifying the genetics of our food in order to make them more drought and pest resistant (the 1980S) and to grow bigger crops that produce higher yields, I was all for it. I thought that if they could come up with a way to “improve” upon what we already have, that’s where science shines. Since then I have evolved in my thinking, which is ok to do if you make an informed evolution. The GMO products on the market are modified to kill weeds and insects, be more drought tolerant and make those delicious tomatoes that we buy in the store nowadays that look beautiful but are completely devoid of flavor. Now maybe it’s just me, but if I’m eating something that is modified to kill an insect or weed like you do with Raid or Roundup, I have to believe there’s low levels of something that can’t be good for humans either. And I really do believe that initially they won’t kill us. I don’t think you’ll drop dead from drinking a soda. The problem for me, and though these foods have been “generally regarded as safe” by the FDA, is that there was never any long term study done as to their effects on us over time. Now they’re finding that low doses in animals actually do cause rather rapid and large tumors as well as kidney and liver failure. I’m sure the study that they did will have its detractors, usually doctors and scientists paid by the industry, but what it seems like to me is that we, the consumer, are becoming the lab rats for the industry and at some point down the road the effects of this practice will become known. What Proposition 37 does is offer the consumer a choice to decide whether they want to gamble on the agricultural industry. Recently there was a big announcement that Organic Food is not nutritionally any better for you than non-Organic food. I, personally, never thought it was. For me buying Organic was making a choice not to ingest pesticides period. By labeling our food GMO and non GMO we get to make a decision on what we eat and drink. This requirement doesn’t come into effect until 2014, and buy then I think the industry can change their labelling without added cost….they’re just asking them to print on the label whether ingredients used in the end product contain Genetically Modified Organics. California, which is one of the largest producers of rice in the world, won’t use GMO rice seeds as the Asian Market who buys most of the rice, won’t buy it. The Anti-Prop 37 (no on Proposition 37) people that are throwing millions of dollars at the initiative are Monsanto, the people that bring us GMO seeds (they hold most of the seed patents) and are manufacturers of roundup (remember the old Disneyland ride to the future), Dow Agroscience, Conagra, Bayer Cropscience (the company that makes the product they suspect killed off the bee population over the last several years), Kraft, PepsiCo, Coca-Cola and others in the food and agriculture industry…you get the picture. I just think we have a right to know what we’re eating and make an informed choice. I always loved chicken and veal Piccata, and mine was delicious! Let's see how we can n(o)il and veganize it. I am using the soy wheat chicken that I bought the other day at the Asian market. Pair this with some mashed potatoes and a large green salad, and it doesn't get any better. After it thickens, put the soy wheat protein pieces back in. In a large bowl, pour the boiling water on the Soy Protein pieces and let them sit for about 10 minutes. Push all pieces under water so that they all completely re-hydrate. After they are done soaking, remove them from the water and let them cool. When they are done cooling, with your hand, squeeze out as much water as you can without destroying the shape of the pieces. Mix all of the marinade together and pour into a zip lock bag. Add the Protein pieces, remove the air from the bag and zip it shut. Move the marinade around to coat all of the pieces. Every now and the move everything around in the zip lock. Marinate for at least an hour or up to 8 hours. Heat a non stick pan until it's almost smoking (and turn on your fan if you have one). Put the Soy Protein slices in the pan one layer thick. They will brown really fast because of the agave syrup, so don't go anywhere. Keep everything in the pan moving with a non stick pan friendly utensil (wooden or plastic). This would be great with lots of sauteed vegetables and served on brown rice. This is the before picture when it's still in the dry state. OK, I'll admit that one of the main reasons I sought out this Asian Market (see last post) was that when I was in Sacramento my friends Rich and Richard took me to a Vegetarian Restaurant and we had spicy chicken wings (not sure why they call drumettes wings), and you would never know they weren't real chicken. They had the texture of chicken, they were juicy and they even had the bone which was actually sugar cane. And let's be honest, they're all about the sauce, so I figured if I could find these the possibilities were endless. In order to get them to my plate faster, and in the absence of time (I was hungry), I put them frozen into a covered cast iron baking dish and to them added Jack Daniels Spicy BBQ sauce with some cayenne pepper, onion and garlic powder. I baked them for about 30 minutes. You're just trying to heat them and get a nice glaze on them. I added about 1/2 cup of water as the sauce out of the bottle is pretty thick and the oven will dry it out more. No Blue Cheese, but you could make a ranch style by using my vegan mayo and sour cream mixed together for the dip....Now tell me that doesn't look tender! My brother and I have been interested in buying food at this place about 30 miles from our house for months. One of our favorite Asian restaurants, Loving Hut, gave us the name of the place that they buy all of their imitation meat. What we loved about this restaurant is that not everything you eat is Tofu, and if you didn't know it was Vegan, you'd think you were eating meat. Most of the products are soy and pea protein based with whole wheat flour. They also had a variety of different textured soy protein for different dishes. The name of the place is Bodhi Vegetarian Market, if you're in California. The address is 8450 Valley Ave., Rosemead. Make sure you ask for the Vegan products as a lot of the Vegetarian ones have dairy. We also bought some Vegan Shrimp that is Yam and mushroom based and looks exactly like 30 count Shrimp. Recipes will follow as I try them. One of the most commonly asked questions I get regarding the fact that I don't cook with oil is, "how do you saute without oil?" That's easy, I dry saute/steam. By this I mean I use a non stick pan (you can use a regular pan, but I think it works best with a good quality, non stick pan). I always get the pan hot before I put anything in it. Mushrooms and onions create a lot of liquid on their own, so I just throw them in first, before any other vegetables. I let them cook in the pan until they are stuck to the bottom, then I use a wooden or plastic spoon/spatula to begin to move them around. After that I add about a quarter cup of liquid, either vegetable stock or water, and everything will lift of the pan and the fond (the brown bits on stuck to the pan) will melt into the liquid and add great flavor to whatever you're making. The other two things I do is either roast vegetables in the oven on a silicon sheet (silpat) or parchment paper, or, as with this particular recipe, I used my barbecue and grilled the vegetables right on the grates. A little tidbit of information you should know about grilling, don't play with your food (I used to say don't play with your meat when I was a carnivore). Vegetables may appear to stick to the grill, but when they're ready to be flipped, they'll let go of the grates on their own.....don't force them before they're ready. Grill all vegetables on the barbecue. Cut onion in half and grill without peeling. Put the garlic cloves on aluminum, but watch this as they cook really fast. Break or cut the remaining vegetables into 2 to 3 inch pieces and put in the Cuisinart. 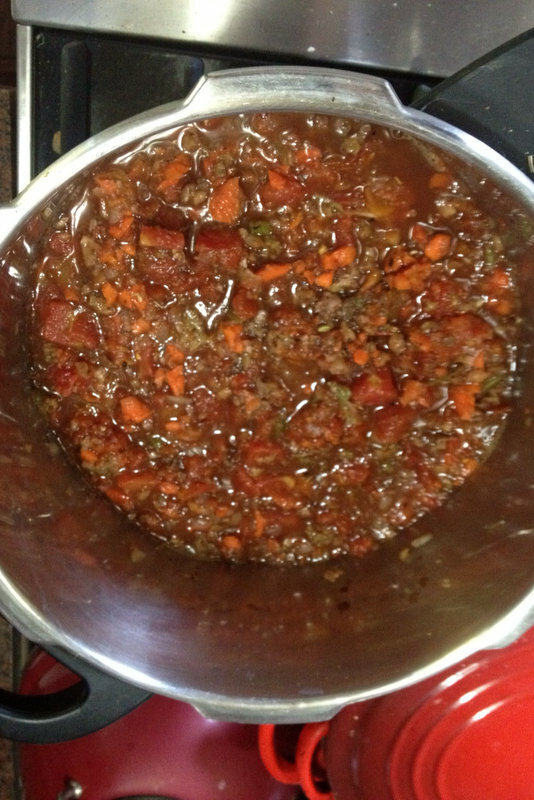 Add the all of the vegetables and the remaining ingredients to a pot and simmer for 2 hours. This freezes really well, so make a big batch and freeze it in useable amounts. I'm not a big fan of juicing as I think you lose one of the main benefits gained from the fruits and vegetables, the fiber. But, if you are, here's a suggestion on what to do with the fiber. I made a clear green cucumber gazpacho a while back and had a lot of leftover pulp (I did put fresh vegetables back in the clear gazpacho before I served it, so everyone did get their fiber....don't want to be hypocritical). I know that people that juice use a lot of citrus, so if you want to use the pulp from juicing, pull out your pulp before you juice the lemons, limes or oranges as they are a bit too bitter. Thinly and evenly spread this on a cookie sheet lined with either parchment paper or silicon pad (silpat). Bake in a preheated 125° oven for several hours (or until everything is dry/dehydrated and you can break the sheet into cracker size pieces). If you want, before it's completely done baking and still a little wet but has set up a bit, use a pizza cutter to cut the size you like. Don't use a knife if you're using silpat as you'll destroy the pad. You can bake these at a higher temperature, say 250°, but you do have to watch it as you don't want them to burn, especially around the edges. Alternatively, if you have a dehydrator you may use that as well. In a pre-heated non stick skillet add all of the onions and carrots. When they begin to stick, add a little of the stock until they release from the pan. Add the chick'n, eggplant, celery, garlic and spices. Stir everything together and let it cook for about a minute, then add the remaining vegetable stock. Let this cook until the carrots are just fork tender. In the meantime, mix the water and Arrowroot to form a slurry (thin paste). While the stock is bubbling, add the slurry slowly pouring over the entire pan while stirring it in. The sauce will quickly begin to thicken. Throw in a handful of cilantro and mint, and the raisins if you're using them. Serve over Brown rice and garnish with more fresh cilantro and mint and lime. I recently traveled to Jamaica and was shocked to find out that the fresh fruits and vegetables I remember having there on my honeymoon were scarce at best. For the first three days of my trip, I survived on side salads from Burger King. Needless to say that wasn't going to get me through the week. I was staying at the Wyndham Hotel in Kingston and on the third morning I decided to ask the cab driver out front where I could find a vegetarian restaurant. He took me to Earl's Juice Garden just within a two minute walk from the hotel. This restaurant was started by a man named Earl Chong who was twice diagnosed with cancer. He studied how diet related to cancer and surprised doctors who thought his cancer was terminal by curing his cancer through diet. The restaurant has a home cooked feel with a very friendly and helpful staff. Every day the menu changes and the flavor of their foods is phenomenal. They make a big pot of porridge for breakfast from 6:00 am until it runs out. Lunch consists of 2 soups and 3 stews that were all delicious. I was also surprised that they use no oil!!!! They also serve a great variety of fresh squeezed juiced fruits and vegetables. I ate every single meal there for the rest of my stay. How can you make crunchy tacos without frying them......easy! Preheat your oven to 250 degrees. When it's ready, take your tortillas and bend them slightly so they will fit hanging through the rack in your oven. They should take between 10 and 20 minutes....just keep checking on them. Different tortillas take different amounts of time. Here's a couple that I had in the oven. Then, go to town with your favorite taco fillings. Mine have a mixture of cooked lentils and black beans loaf that I heated and added cumin and cayenne to. I used this for the filling and garnished it with packaged julienne of carrot and zucchini, topped with homemade salsa. On the side I have Rosarito fat free lime refried beans and canned sweet corn. The brown rice also has salsa and cilantro as a garnish. Healthy, easy and delicious...you got your crunch back! There are lots of different oats on the market these days, but the only one you should be considering are ones that are 100% whole oats. Instant oatmeal has take most of the nutritional value out of the oats in order to gain speed in cooking thereby rendering it more of a simple carbohydrate (simple = sugar to your body). As an example, since I started this diet if I inadvertently order oatmeal in a restaurant and it's not 100% whole, I will have a sugar crash like you can't believe about an hour and a half later. My body no longer wants to process such assaults of sugar on my system. The nutritional properties of whole oats along with the slow burning power of complex carbohydrates (complex = slow burning, more energy for a longer period) makes this an excellent way to start your day. Now, what's the difference between Steel Cut vs. Rolled Oats. Steel Cut Oats take the whole oat, and cut it into 2 or 3 pieces and the bran and germ are still with it. Rolled Oats are processed a little bit more, toasted and rolled flat, but have the same nutritional value, bran and germ as Steel Cut. The only real difference is how they cook up. The Rolled will have a softer, creamier quality after cooking and requires less liquid but more oats than the Steel Cut. The Steel Cut will have a chewier texture and nuttier flavor. I like to make my oatmeal in my rice cooker. My cooker has a delay timer on it so I can set it to 7 a.m. and the oatmeal will be ready when I wake up. This is what works on my rice cooker after lots of experimenting and some disasters (don't make too much or it will overflow through the steam valve). I have a Costco Aroma brand (the less expensive one at Costco, I think about $29). It is a 10 cup rice cooker, but I don't recommend making any more oatmeal than 1/2 cup dry. You might want to experiment a little with these and your specific model. If you want to add other things such as dry fruit, fresh fruit, hemp protein, flaxseed meal, experiment first. Some fruit will absorb more water than others and the dried proteins and meal will need a little more liquid as well. Make extra and freeze them. If anyone out there is considering a change in their nutrition plan and eating habit, or if you just want to be around a lot of people with shared interests and experience, there is a Farms 2 Fork intensive weekend that will be held in Orange County California April 12-14, 2013. This will include speakers: Rip Esselstyn Engine 2 Diet, Caldwell Esselstyn, M.D., Preventing and Reversing Heart Disease, Jeff Novick, MS, RD, LD, LN, Ann Esselstyn and other guest speakers. The early bird special price for this weekend is $550. Check it out and check out the reviews from other intensives around the country. OK, I have to admit to one thing I do miss on this whole foods adventure, sour cream. I love everything about it and the possibilities you can do with it. I used to just eat it out of the container with tortilla chips. Ahh, memories....I digress. But seriously, who doesn't love sour cream on a potato or as a base for a dip. Even add a little honey for a decadent dessert topper. I searched around to find out how other vegans made it, but I didn't hold out much hope for taste and texture. Here's what I came up with. Before you go to bed, put the cashews in water and cover by 3 inches. By tomorrow night you'll be on your way to sour cream heaven. When you wake up, pour out the liquid, rinse the cashews and cover with more water. At the end of the day, pour out the water and rinse them again (I can't lie, I actually took two days to do this but not because they weren't ready after the first day, I just wasn't ready to make this simple treat). Put the cashews in your mini cuisinart, blender, vita-mix, magic bullet or whatever you use to pulverize. Add the lemon and vinegar. (I like it sour, so if you think this sounds too sour to you, add less lemon). Keep blending until you get the consistency you want. You'll have to use a rubber spatula a couple of times to push everything on the sides back to the middle. If you think it's too thick, just add some water, about a tablespoon at a time. Remember, you will probably need to stir it up before each use if you don't use it all at once. Sliced the whole package of baby Portabella mushrooms. Heated a non stick pan until smoking hot and added the sliced mushrooms. Don't touch for a couple of minutes...if they start to smoke, turn them down. They will start to release their liquid so flip them over in the pan. After another minute they should be starting to brown up. When they get to where you want them, add a cup of white or red wine and let it reduce down (about half the amount of liquid). Add 2-3 cups of the marinara sauce, the sausages either sliced or whole, cover and wait until the sausages thaw a bit. Cut out the vein of several Kale leaves and slice them up into 1 inch ribbons. Throw them in the pan with the marinara and a half cup of water. Cover and let it cook over low heat. In another pan add 1 1/4 cup of water. Bring to a boil and add 1 cup of the couscous (any kind). When all of the water is absorbed they should be done, but check to see if they are al dente. This is one of our favorite foods. Very flavorful, no oil or fat. It works really well with the vegan sausages. beans on top of it and added sautéed onions and bell peppers. Had corn on the cob with it. Now that we have the stock down, let's do something with it. This is a really easy soup, and like most soups, tastes better the second day. Using a really hot non stick pan in this order (about 1 minute between each follow), saute the onion, followed by carrots and celery, followed by bell pepper and jalapeño pepper. Add the garlic and cooking wine and herbs. The wine should help to deglaze the pan. The brown bits on the pan add the most amount of flavor, so make sure, using a wooden spoon since this is non stick, and scrape up the bits. Once the wine is almost evaporated, transfer everything into your soup pot. Add the lentils, beans, tomatoes, Braggs Liquid Aminos, Roasted Vegetable Stock and Cracked Black Pepper. Cover everything and cook for about 30 minutes. Taste for Salt. Cut a whole clove of garlic in half the long way. Rub the cut side all over the toasted bread. Spread some ripe avocado on the bread. On the avocado in the picture I have seasoned nutritional yeast sprinkled on. I've been slowly reorganizing the Recipe Section of the blog. In doing so I noticed that Hummus never had it's own post. It's such a versatile ingredient and this oil free version is amazing. I like to buy the whole wheat, no oil lavash (Trader Joe's carries it) and bake the sheets in the oven until crispy at 350 degrees, break them up and you have chips for dipping. Another added side benefit of a whole food plant based eating program is your food cost will go down. You eliminate the cost of meat, dairy, and cooking oil entirely. Yes, you'll replace it with something else like soy or almond milk, beans, legumes and veggies, and if you get exotic and make seitan it's about $1.00 per pound. In my previous post I showed you how to make roasted vegetable stock. Now, in doing a comparison of my roasted stock to store bought it's a little difficult as there aren't a lot of options in the store for the roasted version of this stock. So, I'll just show you based on the no fat, low sodium version of vegetable stock. An average cost of vegetable stock is between $3.50 for 16 oz up to $8 for higher end stocks. Here is what a label off a box of low sodium (emphasize low) Kitchen Basics Organic Vegetable Stock looks like and this is the fat free version. This is the cost of my no fat, no salt version for 16 oz. 40¢ 3 hours of your time, plus cooling time, so if you want to factor that in, that's fine, though cooking and cooling are passive times so you can really only count the 7 minutes prep time. And you get all of this for about $7.00 (about 5 quarts or 10 16 oz boxes).